It’s showtime and we have 40 pairs of tickets for the UK’s biggest leisure vehicle extravaganza – the Motorhome and Caravan Show 2018 – up for grabs! 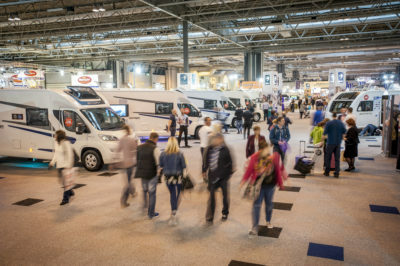 Whether you’re looking to upgrade your motorhome, caravan, campervan or trailer tent; or you just want to see what’s new from the top UK and European manufacturers; or maybe you’re after an essential camping accessory; then you won’t want to miss the Motorhome and Caravan Show 2018 at Birmingham’s NEC. 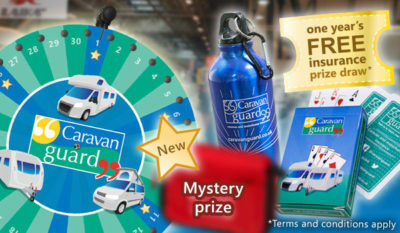 The show runs from October 16th to 21st and with more than 400 exhibitors, including Caravan Guard, it promises to offer lots of inspiration for your travelling adventures in 2019. You’ll get to see an array of new models for the 2019 season, such as the new Swift Elegance Grande 655, with its drop-down bed; the Bailey Phoenix and Pegasus Grande caravan range; the new Roller Team Toleno and A-Class Pegaso, as well the new campervans and motorhomes from Elddis. Thetford’s dual opening fridge features in the new Coachman Pastiche 470 and Swift Kon-tiki 675 and there’s Lunar’s new Quasar 686, 8ft wide six berth tourer. There will be daily launches in the Live Theatre, along with celebrity cooking demonstrations and expert talks from household names including George Clarke, Sharron Davies MBE and Dr Hilary Jones. It really is a fun day out for all the family! 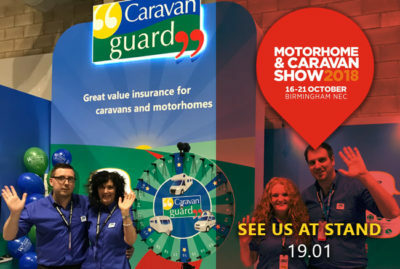 Visitors will find our team of friendly caravan and motorhome insurance advisers in Hall One, on stand 19-01, with our ever popular Spin the Wheel competition where you can win one of three fantastic spot prizes. Everyone who takes part will also be entered into a prize draw to win a year’s free caravan or motorhome insurance. Find out what we’re up to at the show by following us on Twitter or liking our Facebook page. We have 40 pairs of tickets to the Motorhome and Caravan Show 2018 up for grabs. The closing date for our FREE ticket draw is 23.59 on October 2nd, 2018. Terms and conditions apply. See the entry form for details. Tickets are on sale now from as little as £8.50*. To book tickets call 0844 338 7799 or visit www.mcshow.co.uk. Tickets include FREE parking, Show Guide, and kids 15 and under go free too! Closing date for entries: Midnight, October 2nd 2018. *£8.50 senior (over 60s), £9.50 adult when booking before 23:59hrs 15/10/18 after which time prices revert to the on-the-door price of £12 senior and £13 adult. A £1.25 transaction fee applies. Calls cost 7p per minute plus your ‘phone company’s access charge. Car parking is included in the ticket price. No dogs (except assistance dogs). Children 15 years and under go free when accompanied by a paying adult/senior. Tickets are non-refundable. How do you find your way on your caravan and motorhome trips?